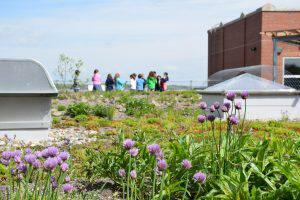 The Doane Stuart School has extended its new 22,000 square-foot energy-saving, vegetative rooftop, to public use! If you’re looking for a rental space to host a social gathering for work, a birthday, or private celebration – look no more. Have your celebration on the gorgeous Doane Stuart Green Roof that can hold up to 50 people. 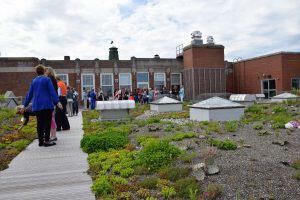 The Green Roof features an open air patio and central garden. The setting is beautifully garnished with sedums, ornamental, alvar, and native North American and New York plantings. This upscale green venue provides spectacular views and decor. Situated on the Hudson River, enjoy stunning mountains by day or shining stars at night. If you host an event from the afternoon into the night, prepare to bask in a beautiful sunset. 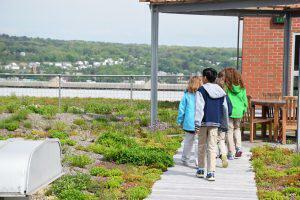 This eco-friendly rooftop was funded by a $1.4 million grant by New York State Environmental Facilities Corporation. It serves to give students practical, hands-on experience in the sciences. Through experimentation, students have the ability to study biodiversity, weather patterns, and plant seeds. The Green Roof also has economic benefits such as saving energy, cutting expenses, reducing stormwater runoff, and improving insulation. T hrow your next networking event, launch party, or teach a class. The Green Roof will provide a unique experience that will keep your guests talking, long after the party ends. ( Phone:(518) 465-5222, ext. 203 Email: dgallagher@doanestuart.org) now to reserve the space for your next gathering. 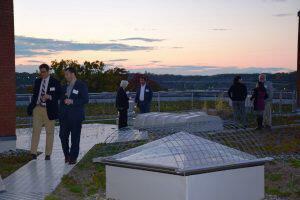 Socialize while you economize, with a special event at The Green Roof. Fill out this form and we will be in touch with you very soon to follow up on details and rental possibilities for your event or visit.